Welkom in het hart van Floreasca: het groenste, meest exclusieve gebied van Boekarest. De flat is onlangs gerenoveerd, volledig ingericht en heeft een slaapkamer. We zijn geschikt voor 4 personen, want er is een queensize bed en een slaapbank in de woonkamer. Een onlangs gerenoveerde flat met een slaapkamer in het meest exclusieve deel van Boekarest. Location is excellent: lots of high-end restaurants and grocery stores around. Taxi station across the street. A mall about 2km away. The apartment is well maintained and has everything you need. Hot water and heat have always been available (this might be an issue with other locations in Romania). Communication with owner was excellent. Bottomline: I would definitely stay here again for my next visit. Good location, quiet, modern accommodation! The apartment is modern, extremely clean and filled with all the basics you'll need. Communication throughout the entire process was very good. Yannis was quick to respond to messages and maintained contact with me to ensure that we arrived safely and had all we needed. She detailed all the essential information that we needed both verbally and in written form. Her written instructions outlined the facilities, access codes and general information about local area, which proved to be very useful in enhancing our overall experience. The apartment itself was spotlessly clean and very spacious yet extremely comfortable. All opening windows were fitted with insect nets to prevent an "invasion" of bugs and curtains to diffuse the strong sunlight. The bedroom was airy with the addition of a large freestanding fan to keep it cool. The lounge offers a generous sofa bed and simple contemporary furniture to compliment the style of the property and air conditioning to help keep you cool. The kitchen and bathroom are well stocked with a variety of gadgets and time saving devices and essentials such as a hair dryer, ironing and coffee machine - we lacked for nothing. 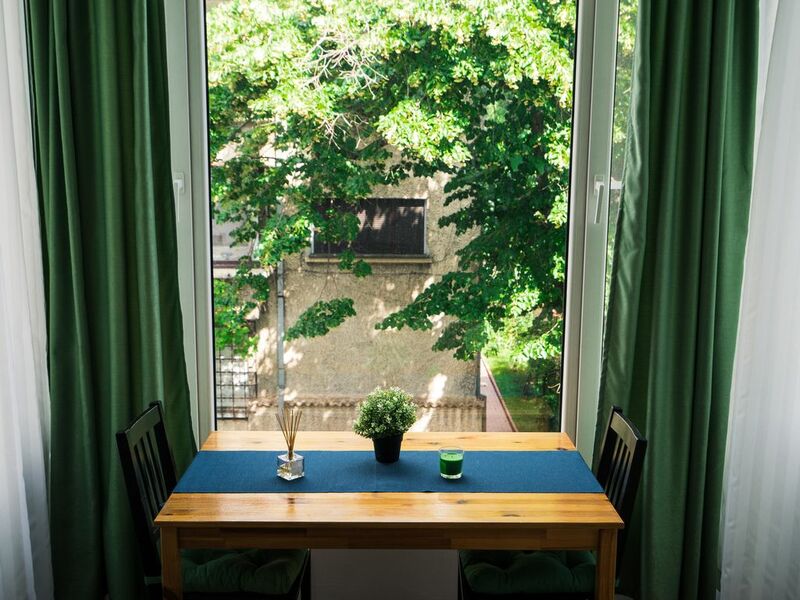 It was an absolute pleasure to stay at this delightful apartment set in the charming leafy suburb of Floreasca, surrounded by cafes and restaurants. I would highly recommend this property to anyone looking for a quite base within easy reach of the Metro and all the main sights. It is definitely a property I would highly recommend and would have no hesitation to returning to this peaceful haven. I loved the location and the apartment. The owner was accommodating and gave several suggestions for things to do. So many things in walking distance. Also, traffic is lighter than most areas.